This is the only goal on this list that is 100% finished, so I'm going to celebrate it. When I made this goal, the ALA youth media awards had not been announced yet, so I didn't know what I would be reading. The book that ended up winning the Newbery medal was one I hadn't even heard of (which wasn't all that surprising considering I didn't really keep up with the bookish buzz the way I had in previous years). The 2018 winner was Hello, Universe by Erin Entrada Kelly. I listened to it soon after it won, and, although I really enjoyed it, I was still pretty surprised that it beat out all the other contenders. I can see myself making this same goal for many years down the road though because it's so fun to read the winning book, regardless of what it is. I follow Carter Higgins and Danielle Davis on Instagram, so I was very aware when both of their books were published last year, especially because they were first novels for both of them. I intended to read them last year, but my intentions are never as strong as my goals, so this year it's actually happening. I read Zinnia and the Bees a few months ago, and it wasn't my favorite (I actually think I might have liked it more if I could have listened to it, but currently there isn't an audio edition). 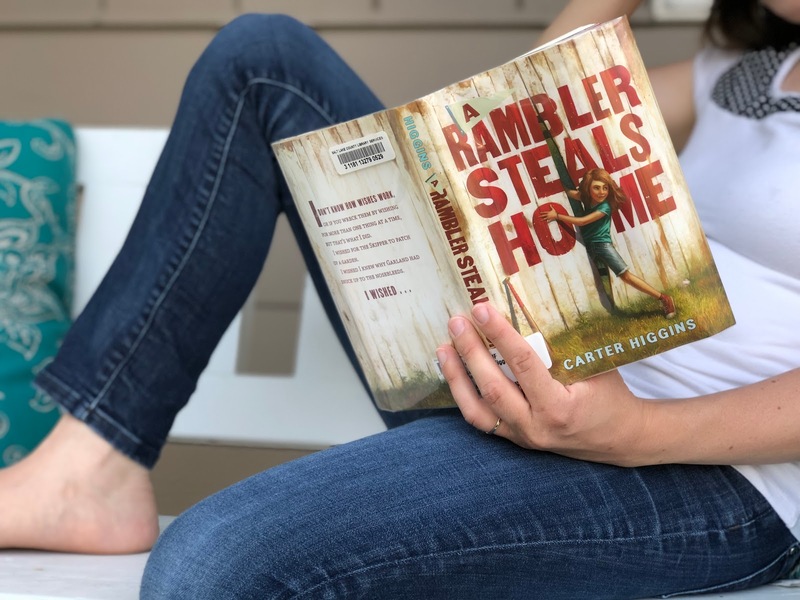 I'm in the middle of A Rambler Steals Home right now, and so far, I'm liking it quite a bit more than Zinnia. I have the audio of To the Lighthouse on hold at the library right now. It would be awesome if it came in soon since I'm currently without anything to listen to (something that doesn't happen often), so I could get to it right away. So I guess the solution to my dilemma "Find books to recommend to teenagers" is as simple as diving back in time. So far I'm loving this goal. I read And Both Were Young by Madeleine L'Engle (published in 1949), and it was a treat. I've read one other so far, but I read it in July, which is technically the second half of the year, so I'll keep you in suspense. If you have any other older titles to recommend, please share! As a reminder, my book club decides on their schedule for the entire year by having each member bring three recommendations for a certain genre. My genre was nonfiction for the month of September, and the three books I recommended were Dead Wake, Walkable City, and The Four Tendencies. The book club members voted and chose to read The Four Tendencies, but I still wanted to read the other two as well. So far, I've read The Four Tendencies (because my family also chose to read this for our family book club), but I've had Dead Wake checked out twice from the library already, so does that count for anything? I've kind of been saving this one for the fall because I'm planning to read Wuthering Heights, and it just seems like it will fit the mood of that season. Tell me if I'm right. So far, this is my least favorite goal. That could be because the one book I've read for it so far (Tom's Midnight Garden) I didn't really like. But I'm also just finding it frustrating to choose a book from the book lists (which I wasn't expecting at all; I thought that would be the fun part). I think I'm making it more difficult for myself because I added the stipulation that the book had to be one that wasn't already on my to-read radar. This made sense at the time because the whole point of looking at the book lists in Honey for a Child's Heart was to get new ideas. But I'm having a hard time finding books I don't know about that actually sound good. So maybe I should just use the book lists to remind myself of the good books I've been wanting to read. Sounds like a better plan, right? These are both books I've had on my parenting to-read list for awhile, but I don't really know anything about either of them. I need to read a bunch of reviews of each one so I can decide which book will most benefit my parenting at this time. If you've read either of them, I'd love to hear your opinion/recommendation! Clara Parkes is a knitter who writes memoir-type books about knitting. Her latest book, A Stash of One's Own, is actually a collection of essays written by other knitters, and it's the one I want to read for this goal. Sadly though, the library doesn't have it, but I asked if they would order it, and they did. Now I'm just waiting for it to come in and be processed, which I anticipate taking a fairly long time . . .
January: Notes From a Blue Bike by Tsh Oxenreider. February: When Breath Becomes Air by Paul Kalanithi and The Hiding Place by Corrie Ten Boom. Apparently, I completely spaced it in June and forgot to read a book. Luckily, I read from two books in February, so I'll count that. I'm looking forward to continuing this goal for the second half of the year and revisiting more of my favorite books. Excluding Goal #10, I have only read five of the sixteen books I need to complete these goals. In other words, I'm in trouble. Or at least I need to up my focus for the last half (now down to just five months) of 2018. How are your reading goals coming along? What has been your most challenging read? Most enjoyable? For an older YA book, try Angel in Heavy Shoes by Lenora Mattingly Weber. I read about 20% of Simplicity Parenting and had to return it to the library because the tone reeeeally bugged me (and I'd already hit the renewal limit and hadn't been motivated to read it quicker). HOWEVER, I have heard EXCELLENT things about it from so many people that I'm half tempted to check it out again and just push through it. We shall see. And this is probably something you've already done, but if you haven't, you can print out the Newbery list all the way back from when it started (like back in the first half of the 1900's), and it includes all the winners as well as all the runners up. That would give you plenty of older YA reads! I am super far behind on everything, but maybe bring the lists of books from Honey for a Child Hearts to a few friends and see if they recommend something? I'm looking to see if I can find some of the titles. Have you read Misty of Chincoteague by Henry, Marguerite? I remember liking those, although I admit I don't remember which plot went with which book. Swallows and Amazons by Ransom is also a lot of fun and involves independent siblings who have a lot of fun together.